Growing up, Josh always thought he would move to the Rocky Mountains and live the itinerant life of a fly fishing guide or ski bum. He made it as far as the Ozarks, and then decided to get a real job. Law was a natural choice - the practice is engaging, challenging and rewarding. Josh is proud to help the hard working families and small businesses that make Northwest Arkansas one of the Best Places to live in America. .
Josh represents clients in all manner of civil cases, including family law, real estate and business disputes. 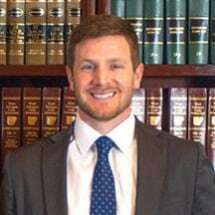 Josh also holds an advanced degree in agricultural and food law. When he's not working, you will usually find Josh spending time with his family, possibly paddling a local river. We at the Hogue Law Firm believe the law practice is more than a career. It is a commitment to our clients and community, to safeguard our foundational values - truth, justice fairness. Our attorneys still believe in a firm handshake and keeping one's word. Contact them today and see for yourself.